Boy, were we bummed! Just when all the grass was showing in the yard and the cows were dancing with joy, we got a winter storm warning for our area. We had two days to get ready so we put out extra hay, fortified the barns and chicken coops, brought in more firewood, and crossed our fingers that it wouldn’t actually come. We woke up to no snow on Thursday when it was supposed to arrive. Okay, so far, so good. But then it started to snow and I mean snow! Holy cow, we got an inch an hour all day. We got our annual April snowstorm — a foot plus of new, heavy, wet snow. David made it to work on Friday morning — in his Ford Fusion — on unplowed roads. But Ashley, who left later, only made it two miles before turning back as the roads were nearly impassable. Finally, the County plows came out and the snow stopped. So Will plowed our driveway. He plowed carefully, as the ground under the snow was not frozen. 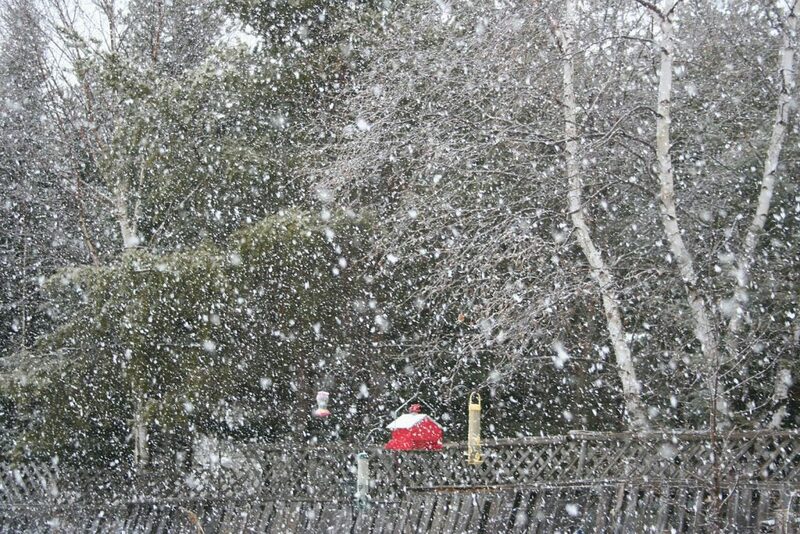 He turned up some snowballs as large as a car that swung the plow truck sideways! But then it warmed up and finally the sun came out this past weekend and the temps got up into the forties. So the snow is going fast, but boy, what a sloppy mess. I can’t wait for it to go so I can get to work on my flower beds, which didn’t get care last year and sadly need it. Our wonderful apprentice, Alisha, fixed up two of the daylily beds real nice and after she left, I got the one by the fish ponds done. But the front beds by the house are pretty sad. I did see a robin the other day, from a distance. But I knew it was a robin by the hop, hop, stop, hop, hop, stop way he was moving. Yea! And I also saw a Sandhill Crane flying up our creek. As the weather is beginning to warm up, David is starting to work on his cabin again. He managed to move everything out of the storage building he was renting so he’ll be saving $70 a month. He did have an unpleasant discovery; due to the heavy snow on his cabin’s roof, the roof had spread the walls upstairs out about 3 inches. So he and Will spent Saturday afternoon jacking the rafters back up into place while using come-alongs and ratchet straps to snug the walls back into plumb. Unfortunately, due to heavy snow, David’s cabin’s roof sunk a bit, spreading the walls outward. The hydraulic jack, come-alongs and ratchet straps got it back to where it belonged. 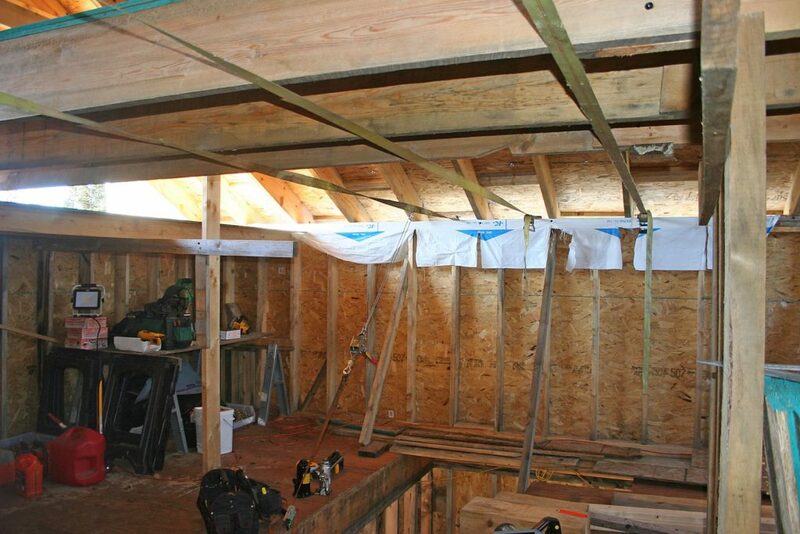 Once that was done, they worked at determining just where the ceiling would be and measured for collar ties which will span the inverted V of the rafters, preventing any future spreading. Unfortunately, David needs some 14-foot 2x6s and has to go to the lumber yard as we don’t have any more longer logs from which to cut them on our sawmill. But the weather’s cooperating and he should be able to pick them up tonight. Then progress will continue. 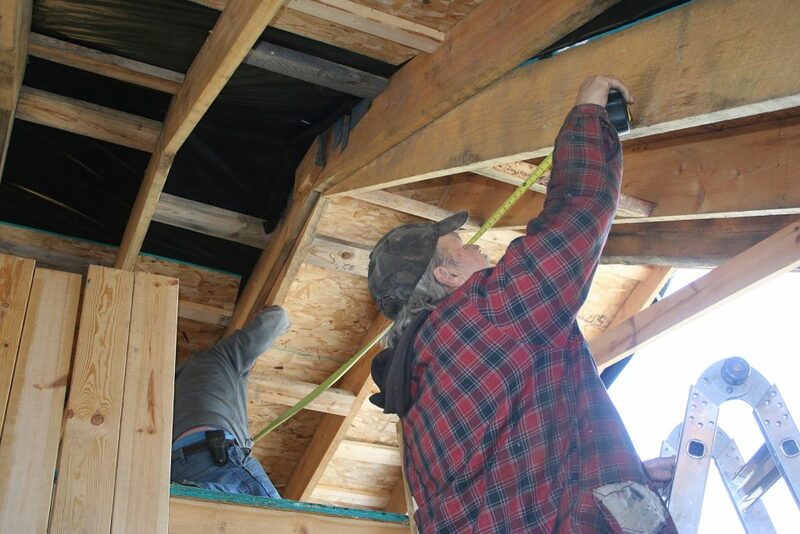 Yesterday Will and David measured for the new collar ties which will prevent future problems and also provide a base for the ceiling of the upstairs rooms. We are set to close on the 24th. All seems flowing well. If it’s any consolation,I planted your bill bean, providers, and hopi pale greys in 78° Temps today. Still sending prayers for ya’ll and David today, and spring will come soon, as it always has…with warm and green wishes too. Prayers coming your way. Blessings. Hope all goes well with the purchase of the 40 acres. You guys will have your own private nature preserve! Yes, we will. We’ve seen bears, wolves, lynx and even a young cougar so far and we sure love those big pines! Spring in the Midwest, ya gotta love it. We got an inch of snow but areas a few miles to 40 miles from us got 3 to 8 inches. Upside is we got the half a downed tree cleaned up before it hit (I’m sure you got the wind earlier this week). I hate to say it but if you need just a bit more for the down payment and you have a CC, I’d take a cash advance and pay it off ASAP. There are times when you need to have a short dance with the devil. Don’t let a few bucks prevent the purchase of the 40 acres. Yeah, we thought about using a cash advance but holy cow, the interest rates are HORRIBLE. Fortunately, we scrambled around and finally got enough cash to make that down payment. Whew! Is the winter ever going to end for you guys? Here’s hoping it does soon as l know your itching to get into the gardens again. My one raised beds is planted full and doing good. I will probably plant the other three this week as Oklahoma has decided to cooperate. Best of luck to David and Ashley on their cabin. Be safe all of you as l so enjoy reading your posts. If you keep buying up land there, they will name the township after you! Good luck! Yeah, it’s kind of an addiction. But Will and I have both had very bad remote neighbors in the past. (One of ours murdered a guy when he stumbled upon him cooking meth!) So besides saving the big pines, we are also buying more distance between us and possible poor neighbors. Sometimes we think that too. But we know it’s coming and are pawing, wanting to get to DOING! We were on the southern edge of that storm and fortunately just got rain and a skiff of snow. The wind has been terrible for the last week and is blowing like crazy today. That would do a good job of drying things off if only it didn’t rain every other day! I have one flower bed that I didn’t clear last fall but its been too muddy to work out. We went into winter with excess ground moisture then have had exceptional snow and rain this winter/spring. Yep, we’ve had the same weather to deal with. But it’ll soon be over.